Dice is used to play many games like snake ladder, Ludo etc. Generally dice is made up of wooden or plastic, which gets deformed with time and become biased. A Digital dice is a good alternative of old fashioned dice, it can’t be biased or deformed. It operates at such high speed that no one can cheat. To create this digital dice circuit, we have mainly used 555 timer IC and 4017 IC. 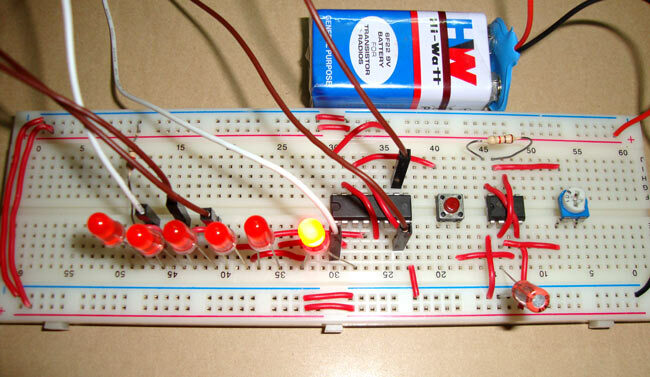 You can also check this digital dice circuit using Arduino. Clock enable pin, should kept LOW, keeping HIGH will freeze the output. In this digital dice circuit we have used 6 LEDs, each LED represent a number (1-6) of Dice. LEDs start flashing as we press the Push button and stops when we release it. After release, illuminated LED tells the numbers, you got on Dice. Like if fifth no. LED remains ON after releasing the button, means you got 5 on Dice. We have connected 6 LEDs to the output Q0 to Q5, and the seventh output Q6 is connected back to the RESET PIN 15. So that after LED 6 it starts from the First LED at Q0. In this digital dice circuit we have kept the oscillation frequency so high that no one can cheat. LED flashing speed is directly proportional to oscillation frequency of 555, as High the frequency, as high the speed of flashing. You can increase frequency according to you, by rotating the potentiometer. How can I control the resistance by remote? Please reply. I want to know the circuit diagram of digital dice by using 7segment display. please send to my mail. Thanks!